Celebrate Canada Day Weekend in the beautiful natural surroundings of Banff National Park. Experience all the fun and festivities that Banff National Park has to offer with jam-packed schedules including the ever popular Canada Day parades, live entertainment, family activities, fireworks, and much more! Entry to the national park on Canada Day is FREE to all visitors. Brewster Travel Canada, in partnership with Discover Banff Tours, the Rimrock Resort Hotel and several local businesses, will be hosting a flood relief benefit at the Banff Gondola. The fundraising event will run between 4-7 pm and include a variety of exciting activities, musical entertainment, a silent auction and refreshments. In addition, Brewster Travel Canada will also be offering rides on the Banff Gondola by donation in lieu of the normal ticket fee to all residents of the Bow Valley. The Banff Centre presents “Classified with Zeus The Eerie Green and Elk Run and Riot” and will be collecting and matching donations for Bow Valley Flood Relief. Doors open at 4pm. Tickets available from The Banff Centre. 12:30 – 3:30 pm | Family Fair incl. Magician show at 1:00 p.m., Face Painter, Bouncy Castle and BBQ until 2:00 p.m.
10:00 – 2:00 pm| Celebrations at Samson Mall including traditional drumming, dancing, singing and food. The Town of Banff has launched a mobile website to help visitors find parking in town. Visit banffparking.ca to view the available parking spots, directions and time frames. Rocky Mountain Holidays have just released a free rail upgrade promotion. For a limited time, book a qualifying Rocky Mountaineer holiday package of four nights or more and receive a free rail seat upgrade on select dates in 2013. Space is limited and availability changes daily. The Rocky Mountaineer train departs from Banff and so can easily be integrated into your Banff National Park vacation plans. This spectacular 2-day rail journey will take you through to Vancouver (with an overnight in Kamloops). It is the only all-day sightseeing train which travels through the Canadian Rockies. There are 3 levels of onboard service available: RedLeaf, SilverLeaf and GoldLeaf. For more information on this limited time free rail service upgrade promotion, be sure to check out the Rocky Mountaineer deals on RockyMountainHolidays.com. This offer is expected to end by sometime next month (June 2013) and is subject to availability. Experience the Ice Magic Festival in Lake Louise, centrepiece to SnowDays, a month-long celebration of winter in Banff National Park. Join us as we celebrate the young and young at heart. Marvel at the finished ice carvings from last weekend’s international competition and enjoy loads of activities and experience focused on family fun. Your kids can learn the art and science of ice carving for $2, crawl through an ice tunnel and cruise down an ice slide at the Samson Mall. Learn from a master carver during the 10 block ice carving demo on the shores of Lake Louise. Skate with the Ice Queen on magnificent frozen Lake Louise. The Cozy Corner includes face painting, crafts and more at The Fairmont Chateau Lake Louise! $2 entry. Enjoy snowshoeing, hot drinks and snacks at the Mountaineer Lodge. Avoid the hassle and take advantage of the FREE shuttle running from the Samson Mall to The Fairmont Chateau Lake Louise, returning every 20 mins: Saturday & Sunday January 26 & 27from 10:30am – 5:30pm. Please drive carefully, obey all no parking signs and watch out for pedestrians. Learn to Snowshoe (Saturday only) – Join a local Banff expert who will share basic skills – free. Banff Park Museum – Known as the “University of the Hills”, the Banff Park Museum is one of Canada’s best examples of a Victorian-era natural history museum. Special winter opening hours! Ice Playground – Kids will love the ice slide and other interactive playground features – free. Cave and Basin Discovery Camp – Get a taste of what camp life was like for the crew that built the Canadian Pacific Railway through the Bow Valley in 1883 – free. Sled Dog Meet and Greet (Saturday 6:30pm) – Meet the dogs, learn about the different breeds with Kingmik Dog Sled Tours – free. Roasted Chestnuts (Saturday only) – All proceeds to the Banff Community High School Sports Program. Ice Climbing Wall – Here is your chance to try ice climbing on a 40ft wall of ice. Equipment and instruction provided for free. Saturday until 8pm and Sunday until 6pm. Banff Ave Base Camp – Have your photo taken for free against an epic mountain backdrop with a selection of vintage skis plus enjoy tea tastings courtesy of the Banff Tea Co – free. Culture Crawl (Saturday only) – Experience Banff’s rich art, culture and history. Canada House Gallery, Willock & Sax Gallery and Mountain Galleries at the Fairmont Banff Springs. 2013 Heritage Swim (Sunday only) – Dare to wear a heritage bathing costume and compete in dog paddle relay races and more at the Banff Upper Hot Springs. Lake Louise Historical Walking Tours – Walking tours departing from the ice castle at The Fairmont Chateau Lake Louise – free. Movies for a Nickel – Parks Canada’s Mountain WIT brings it all back with a collection of classic celluloid from days gone by at the Banff Visitor Information Centre – free. Banff/Canmore Speed Skating Demo – Watch the club practice their skills at the Downtown Skating Rink in Banff. Brewery Tour & Tasting – The Banff Ave Brewing Co invites you to an exclusive brewery tour and tasting. Reservations required – free. Mountain Film Wednesdays – The Banff Mountain Festival World Tour brings a selection of the best short winter films from past festivals to the Elk & Oarsman Pub & Grill – free. Sub Zero DJ Disco Skate – Skate to the beats and lights on Friday nights with DJ Dark Buddha at the Downtown Skating Rink in Banff. If you are on Twitter be sure to enter the following Twitter promotion – all you have to do is follow @HolidaysCanada and RT the tweet below. Competition closes this Friday, November 9 2012 at 10am Pacific Time – Good Luck!!! After many days of snowfall in the Canadian Rockies over the past week, the ski resorts in Banff National Park are opening early. Nakiska ski resort, which is located outside of Banff National Park, announced yesterday that they were opening this weekend. Just a few hours ago, Banff Mt. Norquay announced that they are opening tomorrow (Thursday, October 25 2012) at noon, just a couple of days before Nakiska’s scheduled early opening (and thus stealing Nakiska’s thunder) – way to go Banff Mount Norquay! This is the earliest ski resort opening in Canada’s history (to our knowledge). The Lake Louise Ski Area and Sunshine Village are currently scheduled to open on November 9th 2012 for the 2012-2013 winter ski season. Cheap lift passes are available through the U.K. website SkiHolidaysCanada.co.uk but you have to contact them direct for rates. Their early-bird deadline is December 15 2012 so you’d better get your skates, or should I say, skis on!!! Have a great season and feel free to post comments – we love to hear from you! Ever wanted to experience the award winning Rocky Mountaineer train 2-day rail from Banff to Vancouver, with an overnight in Kamloops? Rocky Mountain Holidays have undisclosed discounts on select 2-day rail departures in 2013 which we are estimating will be of significant savings. They are also offering discounts on departures from Calgary and Lake Louise to Vancouver as well as from Jasper to Vancouver. Click on the link below for more details and let us know how much you save!!! Question: Which website is the “official” website for Banff National Park? As the snow melts and the temperatures start to rise here in Western Canada, it is time to start planning your spring, summer and fall vacations to beautiful Banff National Park. With so much information on the internet with varying degrees of accuracy, depending on the website owner’s intentions, where do you start? Firstly, don’t just submit your information to every website you come across. It is always best to call for information as most reputable companies are able to provide detailed Banff National Park information over the phone. If you are satisfied with the knowledge of the agent you spoke to about Banff National Park, and require more information, then submit your information through their website. Whenever you see the offer of things that are “FREE” without you having to book anything or part with any money, you have to ask yourself if this is really the case? Why would a company, out of their own pocket, send you something for “free”? This is one technique some website owners may use to harvest your personal information. This brings me onto my next recommendation when looking up information on Banff National Park. The following three (3) OFFICIAL websites relating to Banff National Park offer up-to-date and accurate information. These websites should provide all the information you need to plan a successful stay in beautiful Banff National Park. www.pc.gc.ca – This is the OFFICIAL website for all National Parks in Canada including Banff National Park. It is the official Banff National Park website and contains up-to-date information including trail updates. There is also an information centre located right in the centre of Banff at 224 Banff Avenue. 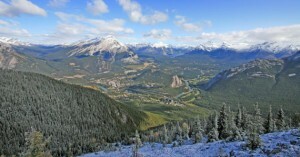 www.banff.ca – This is the OFFICIAL website of the Town of Banff. The information on this website is true and factual and includes information such as the Banff Roam transit schedule. www.banfflakelouise.com – This is the OFFICIAL website for Banff and Lake Louise tourism in Banff National Park. This is an excellent website for viewing up-to-date information such as events in Banff and Lake Louise in Banff National Park. These three websites should be your “go-to” sites to start your Banff vacation planning. I hope you find this information useful and for many of you, clarified which sites are, in fact, “official” for Banff National Park. Feel free to contact us or post comments below if you require any further clarification or assistance. I have been helping guests with their Banff vacations for well over 10 years. Banff National Park is an excellent place to see in the New Year and there is certainly no shortage of things to do and places to go! As always, Banff Avenue at midnight is the place to be to see the fireworks! Start with après refreshments and live music mid-mountain, followed by first tracks on a freshly groomed run, and then finish off with dinner and entertainment in the Sitzmark Lounge. Book in advance. Bubbles flowing, campfire roaring, taste buds exploding: it must be NYE at The Bison! 5PM ($85) & 6:30PM ($125) Seatings | Bison Restaurant & Terrace, 211 Bear St.
Dinner buffet with live entertainment, two seatings. Enjoy a four course meal while Barry Shaw and The Fairmont Banff Springs Orchestra play in the back- ground. Join us to ring in the New Year with our Torchlight Parade down North American Chair, which can be seen from the town of Banff. Live DJ, all party favours and champagne included. Enjoy a fantastic 3 course Greek feast, Banff’s only live dinner show (belly dancing, Greek dancing & plate smashing), party favours and a glass of champagne to ring in the New Year! Reservations required. Featuring the music stylings of Project Mayhem, enjoy the ball with or without dinner. Amazing light show, 3 drinks and delicious appetizer. Enjoy live country music, balloon drop, champagne toast, party favours and a late night appetizer buffet. With works by John Snow, Margaret Shelton, George Weber, D. Helen Mackie, Dwayne Harty, Peter von Tiesen- hausen, Jean Sheppard, James Agrell Smith, Harry Wohlfarth, Illingworth Kerr, Kenojuak Ashevak, Chris Stoffel Overvoorde, Kananginak Pootoogook, Tom Willock, Napachie Pootoogook, John Topelko and others. December 1—30 | Open daily 10 AM—6 PM | Willock & Sax Gallery, 211 Bear St.
Join the parade of Christmas characters as they wind their way through the grand hallways of the hotel, led by San- ta. The majestic mountains beckon all to experience a Christmas holiday filled with laughter and lasting memories. Throughout the holiday season we blend new and old world traditions together with activities designed to intrigue, spoil and inspire you. Whether revealed through fabric, yarn or other materials, the artistic ambitions of the Bow Valley are explored in this exhibition. A selection of quilting, knitted soft sculpture and painting on silk are just some of the examples fea- tured in this informal survey. Good things come in small packages! A favourite tradition of locals and visitors, the Museum hosts its annual holi- day season Art Show and Sale. Choose from individual works of art or handcrafted artisan-made gift items. Watermedia in the Rockies | January 21 through March 20, 2012 | Whyte Museum Watermedia has been a traditional medium for artists in the Rocky Mountains. Keeping with tradition this show will feature the work of watermedia artists who have portrayed their love and respect for the Rocky Mountains and areas nearby.